With some of the most beautiful beaches in the Mediterranean and an average of 340 sunny days per year in which to enjoy them, it’s not hard see why the tiny island of Cyprus attracts 2.4 million visitors each year. However, there is another side to the island and if you have landed on this ‘jewel in the Mediterranean’ it’s well worth escaping the buzzing beaches to experience the idyllic pace of life found in the traditional little villages hidden away in the valleys and hillsides that can be experienced by those who take advantage of Cyprus. Take a 30-minute drive from Limassol and you can step back in time as soon as you enter the charming wine making village of Omodos. Located next to the Chapotami River and sheltered by the highest of the Troodos Mountains, this is the place to stroll the narrow, white-washed lanes before enjoying a lunch of traditional Souvlaki or Moussaka at the village square cafes. Omodos exudes the authentic Cypriot village life atmosphere and the chance to sample the local wines is worth the visit alone. 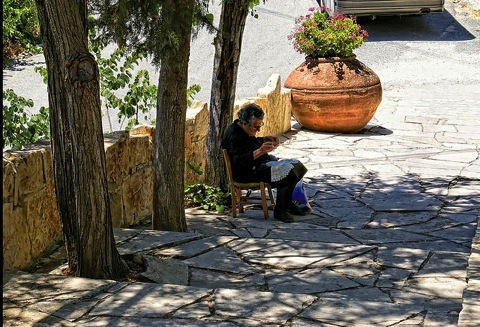 In the small village of Bellapais in northern Cyprus you can truly discover the art of doing nothing. Bellapais is home to the famous Tree of Idleness under which the author Lawrence Durrell wrote the autobiographical Bitter Lemons of Cyprus. The famous 200-year-old tree lies in the heart of this charming village with the restaurant of the same name located directly below, boasting views of the beautiful Bellapais Monastery. The scent of jasmine flowers will help you to relax as you enjoy a leisurely meal or simply a coffee followed by an evening of traditional belly dancing and live music. If you wish to truly escape the crowds then head to the Akamas peninsula on the west coast. This is an idyllic undeveloped part of Cyprus stretching over 230km and featuring such hidden delights as the famous Baths of Aphrodite – the freshwater pool where the goddess of love bathed, and the stunning, crystal clear Blue Lagoon. The Akamas peninsula is one of the island’s natural beauty spots and cycling is the best way to traverse this area. If you are slightly worried about exploring this wilderness alone then there are bike trekking companies available for group travel. Cyprus is a diverse island and it’s a place where you can lie on the beach in the morning and enjoy skiing in the Troodos Mountains in the afternoon. However, you may find that it’s the magical atmosphere of the Cypriot villages and tourist-free areas that provide the richest holiday memories. My husband works with a scientist who grew up in Cyprus and who is married to a Cypriot. She invited us to visit her and and her parents in Cyprus in 2005. We had a wonderful time and visited some of the interior villages. 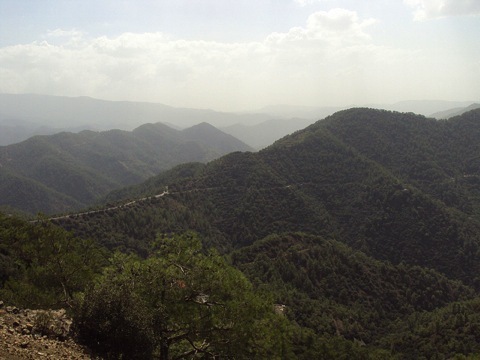 Her family has a summer home in the Troodos Mountains.Cyprus has its own fascinating history and is easy to drive around. Making travel there even easier for native English speakers is the fact that many people speak excellent English, Cyprus having been governed by the British for many years.